(Please remember to bring ID when you come, because at the bottom floor our reception/security desk will ask you for it to print your visitor badge). 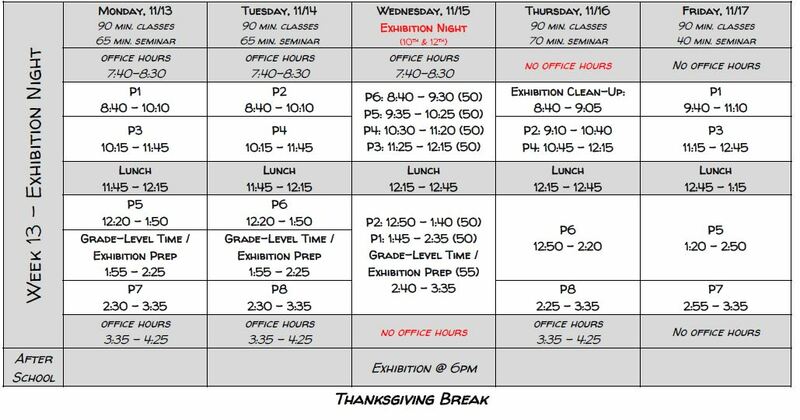 Here is the schedule for the coming week – the last week before Thanksgiving break! Our Exhibition Night is Wednesday from 6-8pm, and in addition to presentations from 10th and 12th grade students, the floors of all 3 schools will be open for you to see! It was a phenomenal first day at our new home! It was awesome to see the students enjoying the beautiful new space and learning in a true 21st century atmosphere. While the day inside the building was wonderful, we recognize that traffic during drop off and pickup was difficult today and appreciated everyone’s patience, especially this afternoon, as we learn how to best navigate this at our new home. We are working on several possible plans to help relieve the congestion at pickup and drop off times, including meeting with El Segundo police tomorrow to discuss potential options. We appreciate your patience and support as we work to provide your students with the best education possible! School Starts at 201 N. Douglas Ave. Tomorrow! We are so excited to welcome you into the new building tomorrow morning! Our staff has been working hard since Friday to prepare the space for our students to arrive. It is such a beautiful space, and it won’t be complete until our students are here! It is recommended that you plan to arrive at 8:00 to allow extra time for traffic. Students will all gather in the outdoor area behind the building (on the west side of the building) prior to the start of the day. At 8:30, DV Science students will be called into the theater, where they will find their advisor and make their first trip up the stairs to their advisory classroom. During advisory time, the students will have an opportunity to explore the 2nd floor. 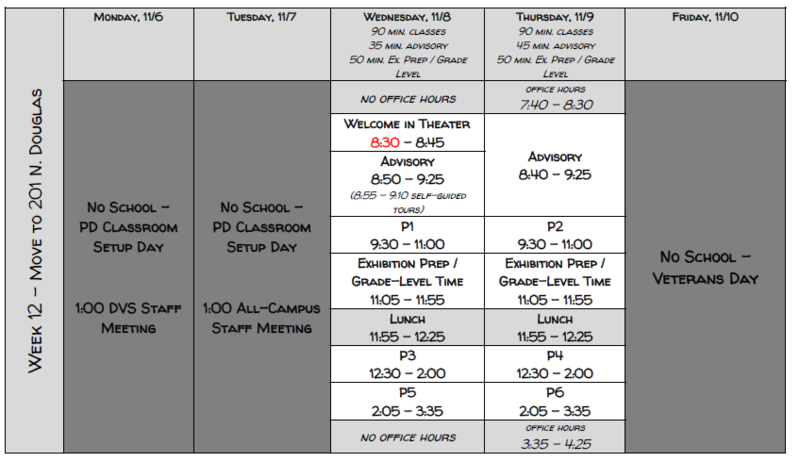 There are no office hours on Wednesday, but all teachers will be holding office hours on Thursday, either before school or after school. Seminars will resume next week!